Zach Hartwig, Brandon Sorbom, Martin Greenwald, Dennis Whyte, Bob Mumgaard, Dan Brunner. There’s a reason fusion is called the “holy grail” of energy sources. The method—which fuses two hydrogen atoms together into helium, producing energy in the process—uses a material that is virtually free, limitless, and equally distributed around the globe and produces energy with minimal environmental impact. “It means you could take out every coal and natural gas power plant and get rid of all of that carbon,” says Bob Mumgaard, CEO of Commonwealth Fusion Systems (CFS). There’s only one catch, says Mumgaard: “It doesn’t work yet.” There’s no question that creating energy from fusion is possible. One need look no further than the sun, which uses fusion to generate all of the energy necessary for life on our planet. In trying to replicate those processes, however, physicists have struggled to keep the atoms in a super-heated gas called plasma well enough insulated to produce net energy. The most successful technique has been to make a donut-shaped magnet cage called a tokamak. But limits to superconducting magnet technology required building bigger and bigger devices to create the conditions necessary to make super-heated hydrogen atoms fuse. This path is culminating in a $30B+ device called ITER, which is designed to be the first to create net energy from fusion, some time in the late 2030’s. Now, a revolutionary superconducting technology allows CFS to take a dramatic departure from that path in hopes of achieving that goal sooner and at lower cost. Instead of building bigger, the company is building smarter, using the same proven scientific underpinnings as ITER, but developing a new type of high-field magnets to better insulate the fusion plasma, allowing for a much smaller reactor. “The shift could be as game-changing as going from a propeller to a jet engine, or a vacuum tube to a silicon chip,” Mumgaard says. CFS has raised tens of millions in investment to pursue their goal, including a $50 million investment from Italian energy giant Eni, and plan to prove the magnet technology within three years. Mumgaard became intrigued by the promise of fusion while studying engineering and physics at the University of Nebraska. “I wanted to do something I could explain at a cocktail party,” he says, “but where if you were successful it would be a big deal and make a difference.” He came to MIT to study at the Plasma Science and Fusion Center (PSFC), where he met fellow students Brandon Sorbom, who is now CFS’s Chief Science Officer, Dan Brunner, now the company’s Chief Technology Officer, and Zach Hartwig, now an MIT Professor. Sorbom became interested in fusion during a fifth year at Loyola Marymount University in Los Angeles, when he was recovering from a sports injury. “I started reading all about energy, and on the last page of a physics textbook, there was a short write-up on fusion,” he says. He began applying to programs around the country, and despite not getting into MIT, he decided to move to Cambridge anyway. He got a job repairing a particle accelerator at the PSFC, until he was eventually accepted into the Ph.D. program. All four were working on Alcator C-Mod, a device using copper coils instead of superconductors to create a magnetic field to hold onto the plasma at high pressure. It was essentially the same concept as a child science experiment running an electrical current through copper wire, “only with a lot more current and a lot more wire,” Sorbom says. The problem, however, was that in order to create enough magnetic pressure, the current had to be so strong that the wire quickly heated up. “You could only turn it on for a few seconds at a time,” Sorbom says. “It was a great demonstration that the plasma physics works, but it was clear we needed new magnets to get to a power plant.” . While C-Mod achieved the highest magnetic field and plasma pressure of any fusion device of its type, the federal government’s priorities were elsewhere, and they decided to pull funding from the experiment. “It was proposed to go from $25 million a year to zero,” says Mumgaard. “It was super disruptive.” The disruption was disappointing to PSFC, it also created an unexpected opportunity. PSFC Director and MIT Professor Dennis Whyte supervised a series of student-led designs using magnets formed with a compound called yttrium-barium-copper-oxide (YBCO), a high-temperature superconductor that transmits electricity with no resistance or heat generation. While the compound had been discovered in the 1980s, it was only recently that companies had learned how to fabricate it into wires long enough and with high enough performance to make a magnet out of it. The high magnetic fields enabled by YBCO resulted in fusion power plants on a much smaller scale than the present path. Sorbom led a student-written paper, published in 2015, describing the conceptual design for a compact pilot fusion power plant, ARC, using magnets engineered out of YBCO. In early 2016 the four scientists presented the idea at the PSFC. “We were surprised by the responses,” Mumgaard says. “Some people scoffed at the idea of private funding, while others grasped it immediately. After the talk the halls were abuzz with scientists talking about ‘risk retirement’ and ‘minimally viable product’, phrases outside the vocabulary of most academics.” This earned the SPARC Underground the support of Whyte and the PSFC Deputy Director Martin Greenwald. Rather than applying for federal grants, they decided to organize themselves as a startup funded through private capital, and CFS was born. While Mumgaard, Brunner, and Sorbom would lead CFS, Whyte, Greenwald, and Hartwig would stay at the PSFC, in a unique partnership to help conduct much of the R&D alongside the PSFC staff and in the MIT facilities. The arrangement is a whole new model for university partnerships, opening the door for innovation at a much larger scale. 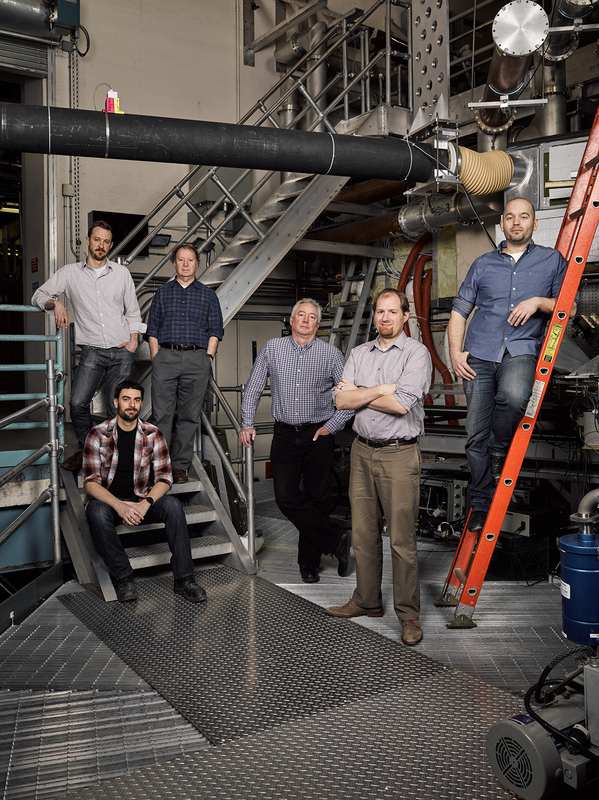 It has allowed the company to launch with a much lower investment in infrastructure and expertise by using MIT’s existing resources, at the same time it allows the university to reinvigorate its fusion energy program with an exciting, renewed focus. As they pioneered their idea, The Engine was a natural place to launch the business. “Fusion is the ultimate tough tech,” says Mumgaard. They plan to develop the new magnet technology within the next three years and build a fusion device with the new magnets to demonstrate net energy from fusion for the first time, SPARC, thereafter. If all goes well, they plan on commercializing the technology in time to make a difference for climate change. Eventually, full-scale power plants would be on the same scale as existing coal-fired power plants. “We think these magnets are the piece that really unlocks the potential of fusion,” Mumgaard says. If they are right, it could mean opening the door to a brand new, clean and plentiful energy future.